This is another table from my “Fabulous Fall Tablescaping” class through Longview Community College. I wanted the students to really feel the atmosphere, so I went a little overboard. They say, “The devil’s in the details,” and I guess there’s no better time than Halloween to let the devil do his thing! It’s cool. Is this not a face you can trust? 🙂 C’mon in! At the front door to greet students was a behemoth python (Spirit Halloween) with his steroid-enhanced spider minions. I trained an uplight from across the room onto the vignette to lend a spooky effect. Tip: Whenever you want something to look spooky, just uplight it like they do in the movies! 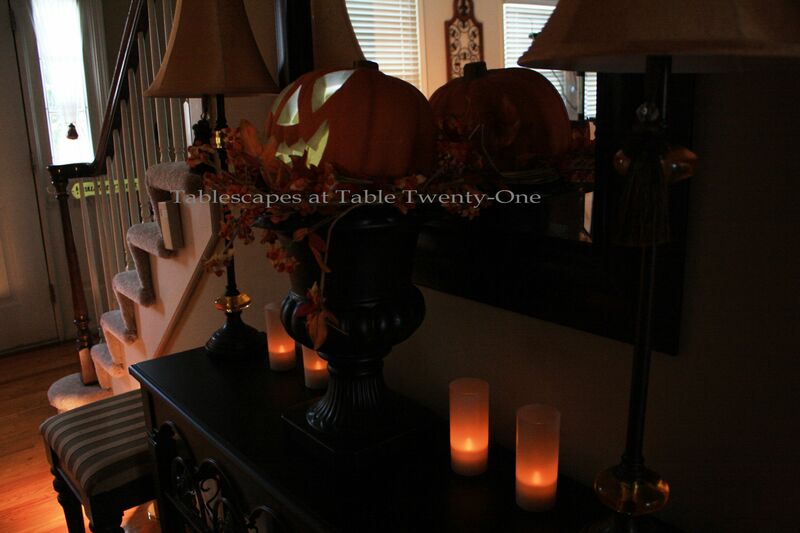 The foyer table just beneath the stairwell is quietly aglow with an uplit pumpkin on a black urn and a few LED candles. 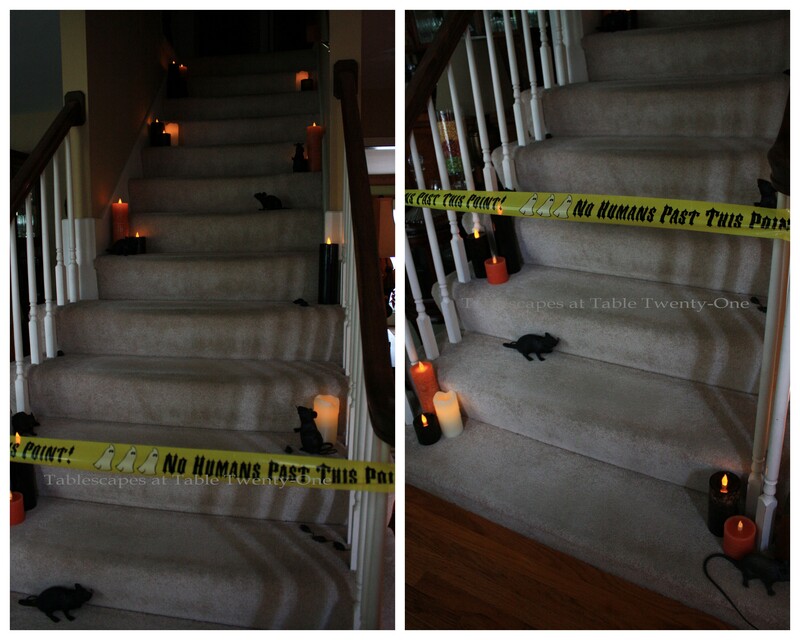 I used LED candles throughout for safety’s sake. Are you ready to step into the graveyard to be eaten for dinner? 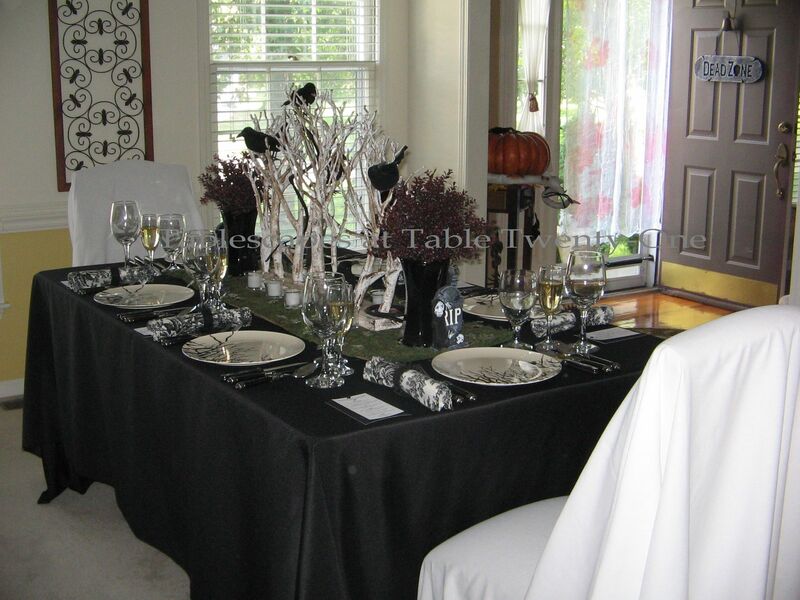 The dining room table is shrouded in a full-length black linen (LinenTablecloth.com) to give the appearance of the items on top just kind of floating in the relative darkness. Plates depicting a raven perched in graveyard branches were purchased at our local Hy-Vee grocery store. They were the inspiration for the room’s overall theme. I used plain clear glass stemware from Old Time Pottery. The flatware is Hampton Silversmiths “San Remo” stainless which in this context takes on a sort of Gothic look. 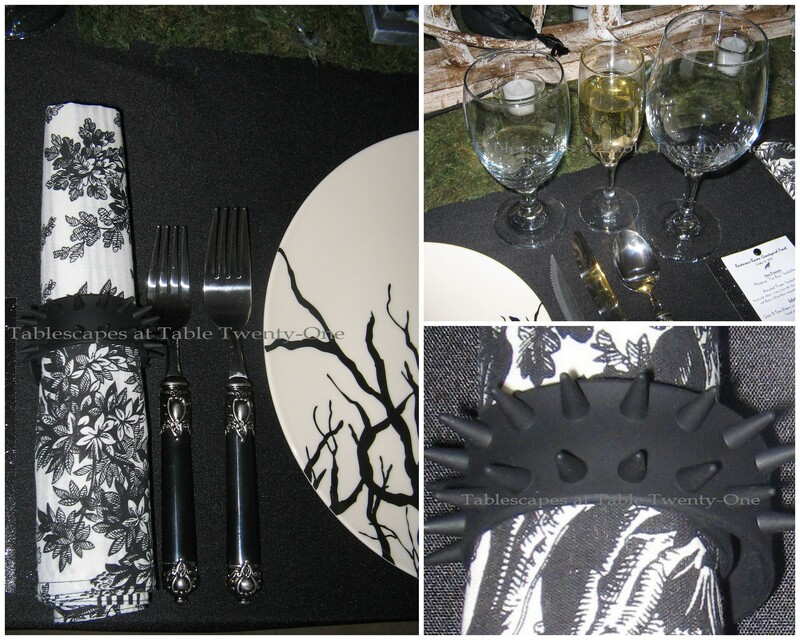 The black & white floral napkins (Stein Mart) adopt a decidedly spookier look when rolled and secured with the spiked napkin ring. The Dollar Tree napkin rings are actually those popular slap on bracelets. These would be really fun as a dual purpose napkin ring/favor for guests! Tip: Stretch your dollars by incorporating favors into the decor! 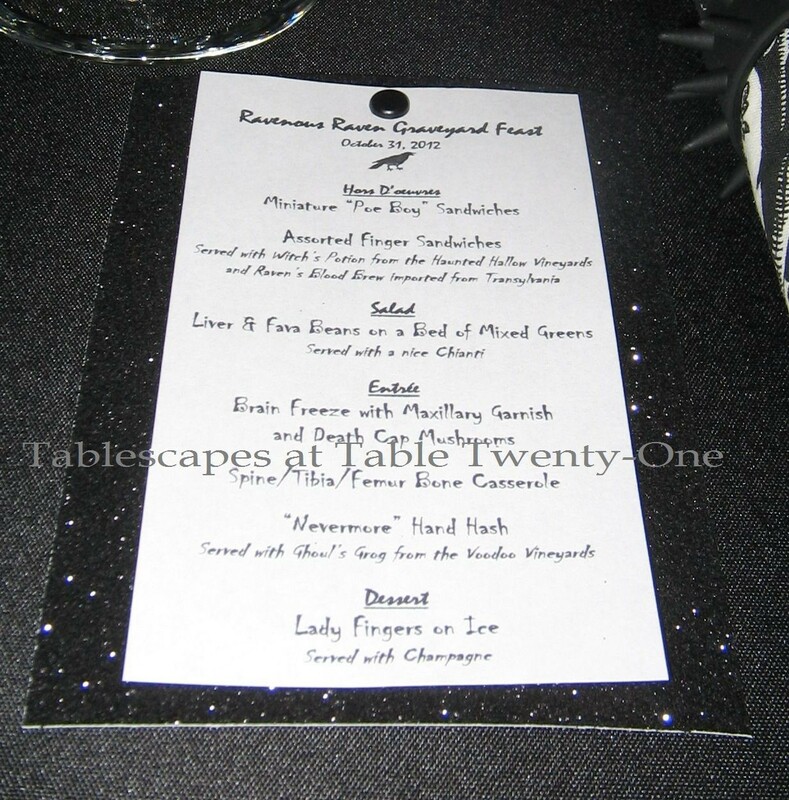 I had fun creating these menus. The backing is sparkly black paper from Michael’s craft store. I secured the printed page onto the backing with a black brad from Hobby Lobby. The main part of the centerpiece is this gnarly manzanita branch structure from Gordman’s. It’s big but guests can still see one another. 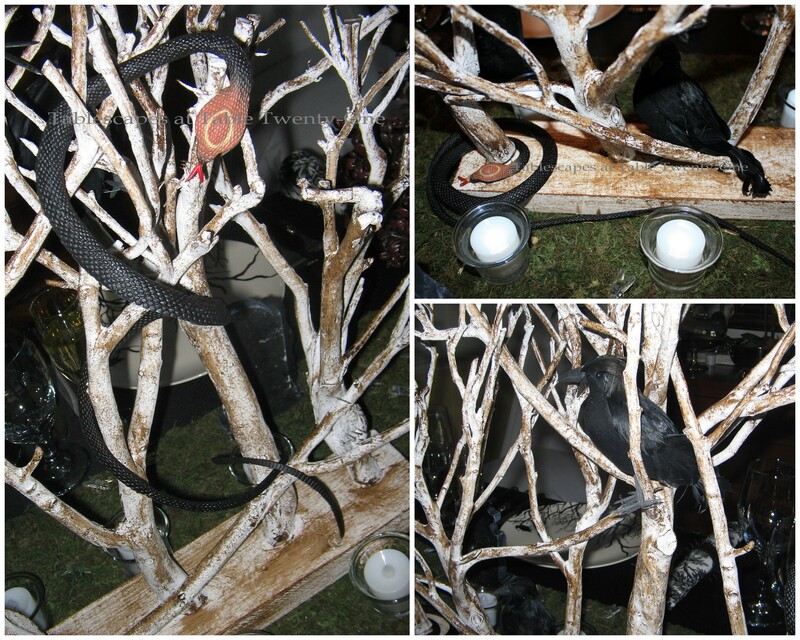 Lurking in the branches are vicious snakes and surly ravens, both from Dollar Tree. 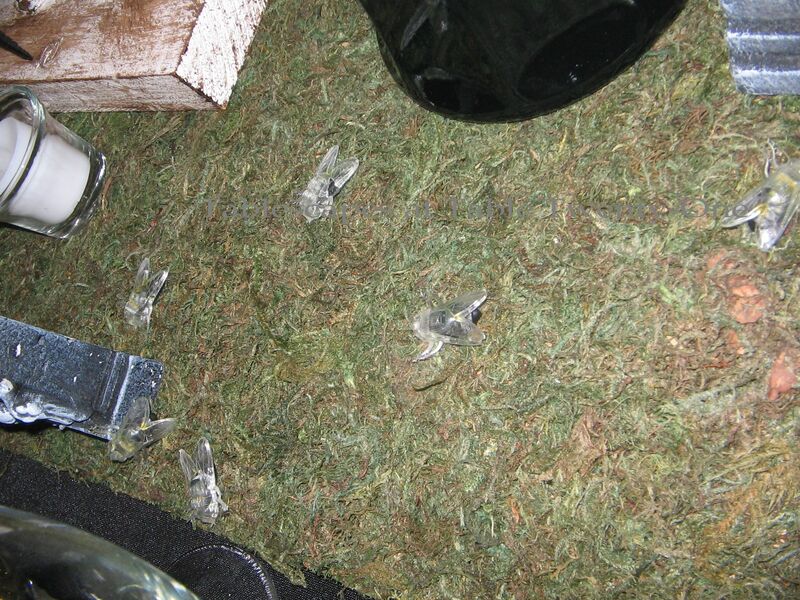 This place is just crawling with bugs…literally! (Dollar Tree) Maggots have transformed into flies that crawl upon the mossy earth around the headstones and beneath the trees. I wanted to use something of a floral nature that would still be kind of dark and morose. 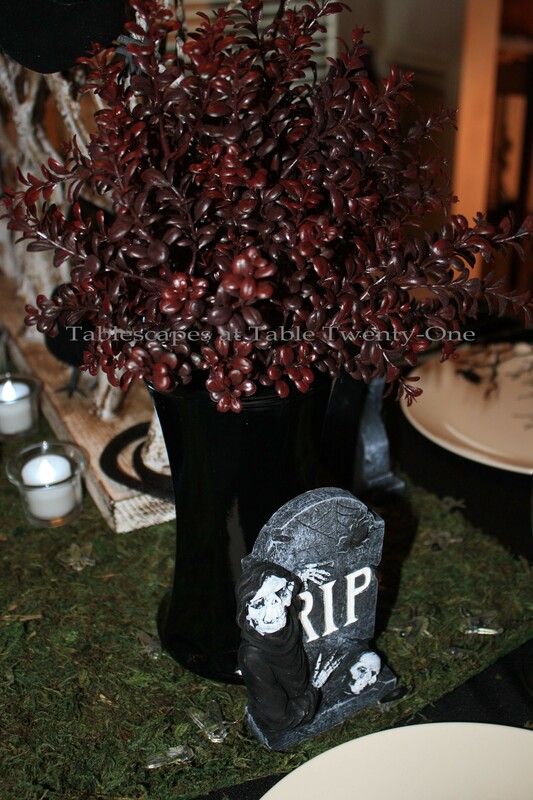 This blood red faux boxwood seemed to do the trick in a black glass vase. A delightful Halloween buffet awaits. Come and get it…if you dare! These tasty morsels may look like calamari at first glance, but they’re actually shrunken & skeletonized hands freshly plucked from unmarked graves. Notice the lovely tarnish on the silver. I created this spooky Halloween “tree” using a fallen limb from our yard augmented with several curly willow branches tied in with a virtually undetectable dark-colored wired jute. I secured the branches under dark river stones in a black urn that I sat on a box (disguised by a black linen) to lend a bit more height. The votive hangers were hand-fashioned from a medium gauge floral wire. 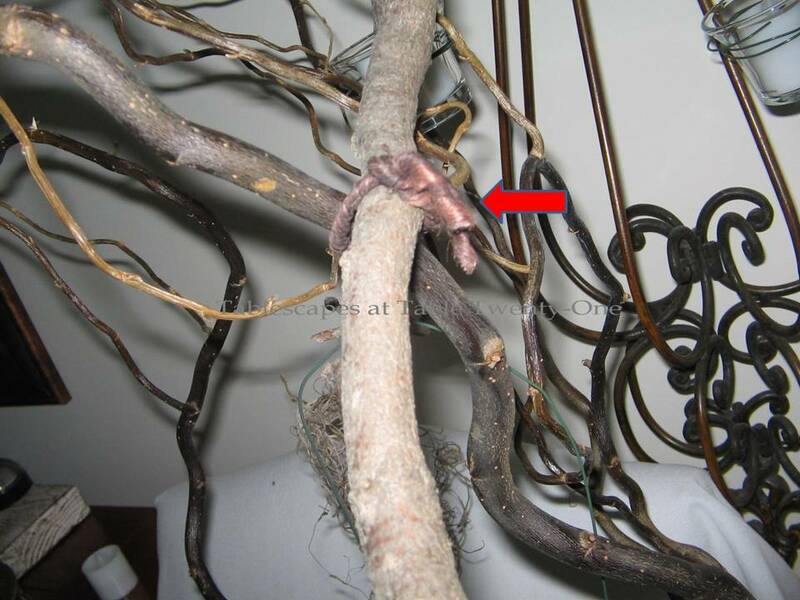 Once again, LED candles are used to be safe around the dry wood. I finished the arrangement off with mounds of Spanish moss. Beneath the tree in true spooky graveyard fashion are miscellaneous bones, a skull, and runaway eyeballs. 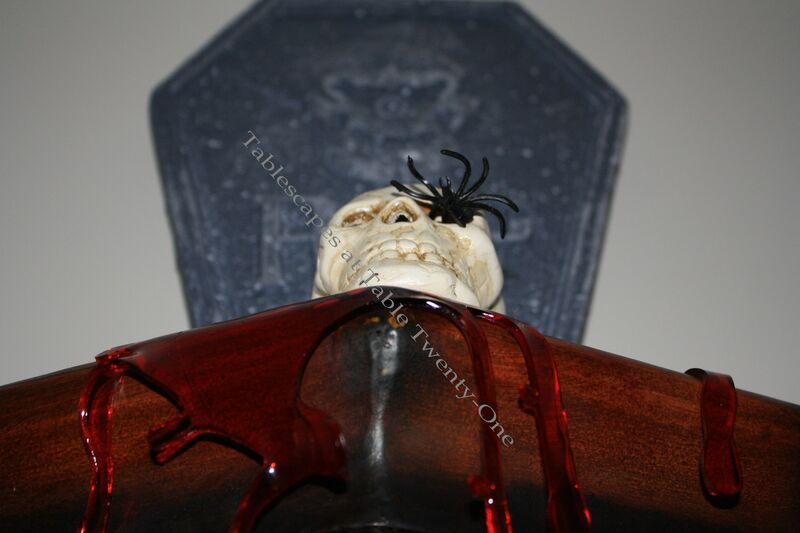 Thick blood pours from lighted skulls on the decorative sconces. 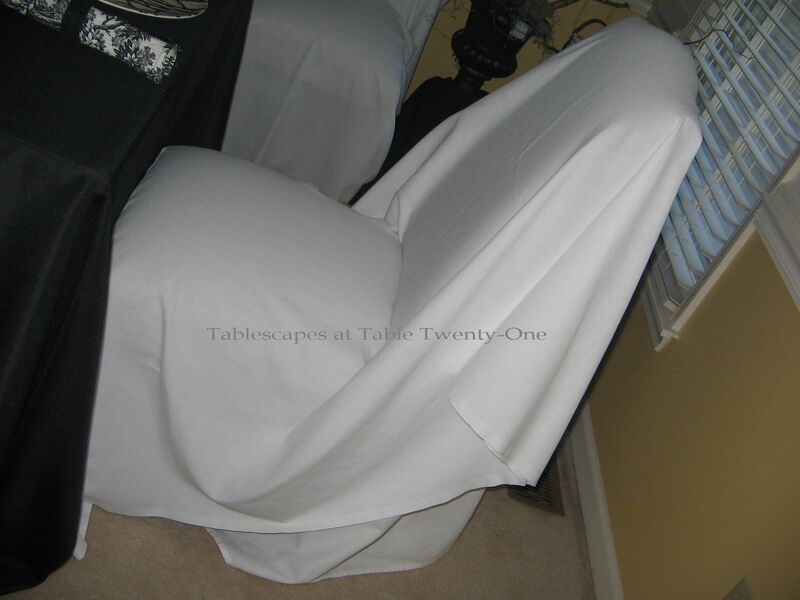 I gave chairs a ghostly look by covering them with oblong table linens. The same effect can be achieved with queen- or king-sized bed sheets. 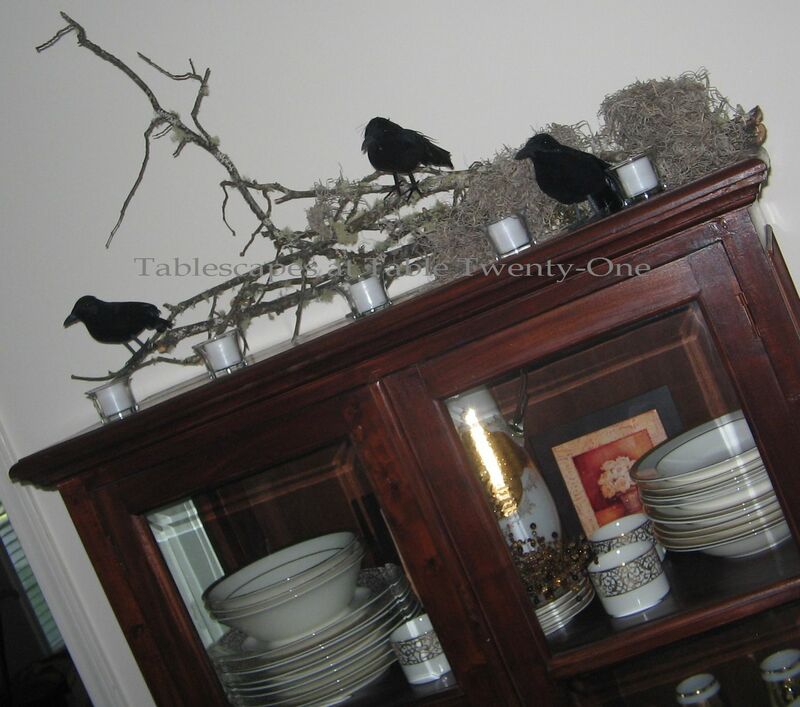 The top of the china cabinet is decorated with moss- and lichen-covered branches. Wow, Alycia, you went all out!! I love it!! 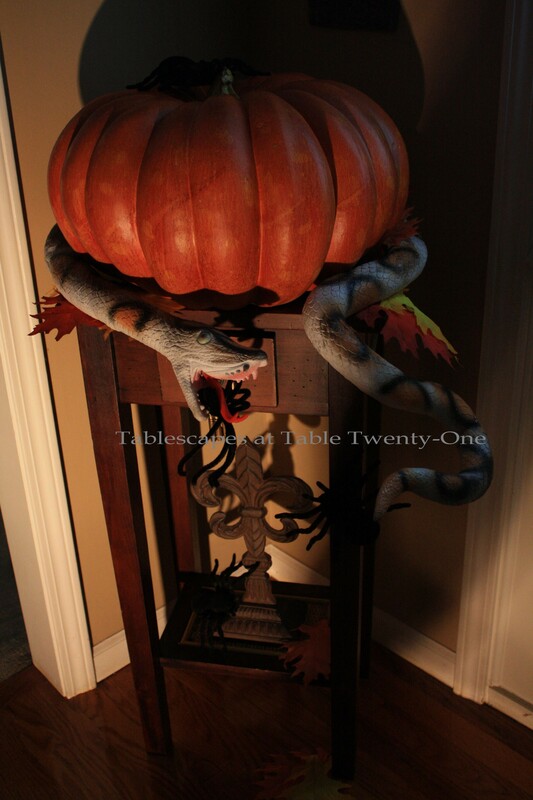 You literally covered every single detail (and surface) with Halloween creepiness! Where do you get the energy? The food looks fabulous!! LOL!!! Alycia, I love it! I agree with Shenita, you seem to have covered every little detail! I love how you used the urn and inserted the branches with the moss! OMG I loved that video! You had way too much fun with this! I love that centerpiece and the tree in the corner! What great effects! Those dishes couldn’t be more perfect either! The finger food (lol!) looks so appetizing! Love the rats and snakes- every bit of it! You ought to charge admission for the kids in the neighborhood and make them work to get their treat!! I think I have my crucifix in hand, trying to navigate this post! This is better than Rosanne Barr who is reputedly the Queen of Halloween, or at least she was till Martha Stewart showed her true colors (and competitive nature). As a kid I got nightmares from Roy Rogers and Gene Autry fighting the bad guys, so please know that I never have gotten into all the spookiness of Halloween. It is fun to see what those like you who love it like to do, but me? I try to ignore it, pretend it doesn’t exist. I have been known to leave my porch light off and hide. Never mind that I met Sweet Husband at a Halloween party. This is fantastic! Your attention to detail blows my mind. Alycia, this is scary as h..e..l..l……!! I’m afraid to come to Halloween dinner if you have one. The idea and creativity is out of this world! Very scary place. You have really pulled everything together perfectly for this ravenous dinner. I bet your students were terrified. Look what you can create when you have a vivid imagination. The menu looks mighty yummy! LOL Love the tree you created..It’s wonderful with the plates with branches. Sorry you had a problem with the fake blood. Good old Dollar store has so many fun gadgets. Love it! AWESOME ! I love Halloween and it looks like you do too. My husband and I used to host a Halloween party/hayride here in the country. 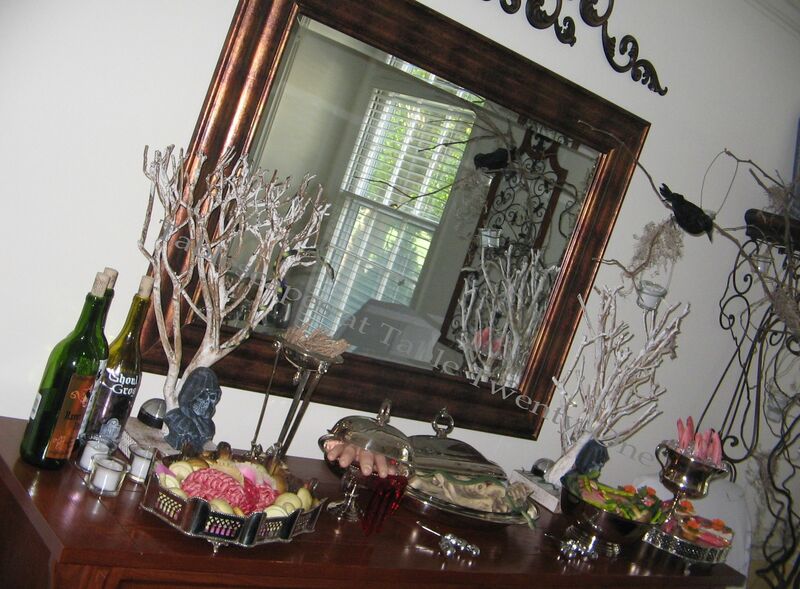 I liked to use dead limbs and hedge apples on the table for decor. A good time was had by all. Girl…….you are one sick puppy! I’m with ya till the flies made their appearance. Really…..just what in the world inspired all of this???? ?n Love it! Oh My Alycia, I think you have officially outdone yourself! The whole scene is perfectly spooktacular! 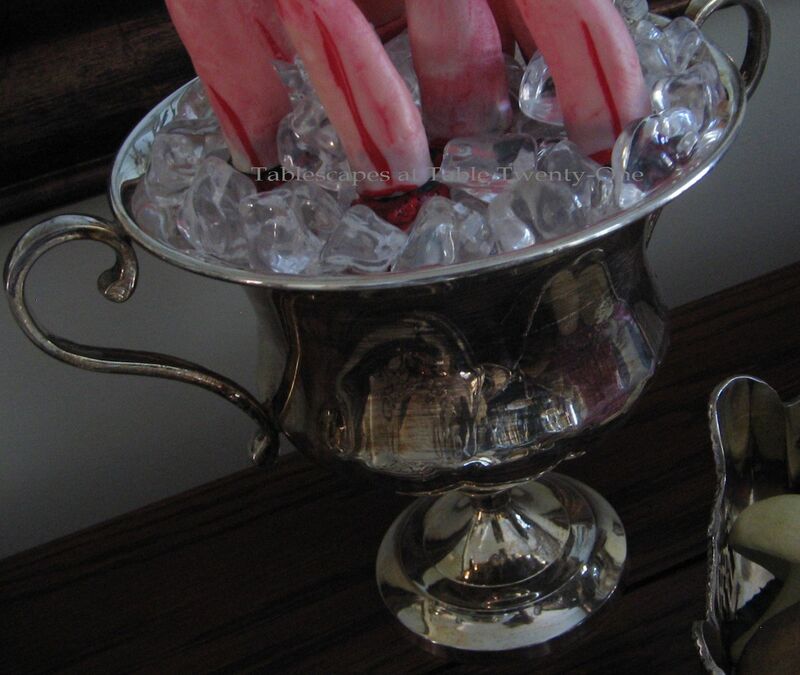 I’m actually afraid to say that the fingers sticking out of the iced silver bowl is my favorite! Positively Creepy! Alycia, again you outdid yourself! What elaborate Halloween you have created! I can’t wait to see what Christmas is going to look like. That is, if you survive the gouls and goblins that will be coming to visit. I’m sure everyone of them will be as they will feel right at home there. OMGoodness Alycia, do you ever sleep?? Your imagination must be going non-stop!!! 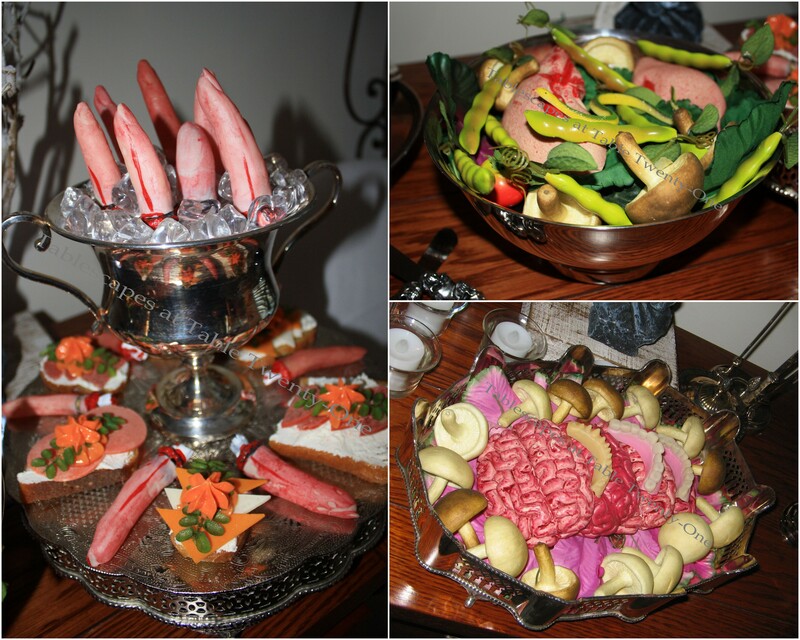 The food is extra creepy for a frightful Halloween experience. It’s like being in a scary haunted house. Oh Alycia!!! This is so spooky that I don’t think I could even sit at your table let alone eat anything!! I can see I will have to have a trip to the USA in October to see these amazing displays!! Nothing like that here in Australia. Alycia~ Your students must have been squealing & screaming in horrific delight! What fun you must have had planning and putting this together, and what effort you went to for your class! 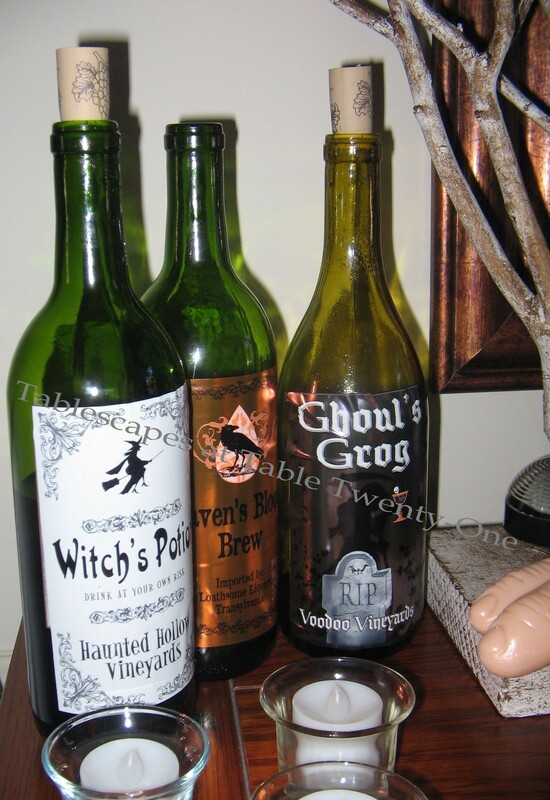 I love your twisted Halloween votive tree in your urn and your menu is over the top, ghoulishly gruesome 🙂 Love your raven perched plates from the grocery store~ that would make grocery shopping much more fun for me! Happy Haunting! First of all I ish our grocery store had such fabulous plates! Theyvare perfect! Your attention to EVERY SINGLE DETAIL is amazingly creative! The tree, the FOOD, the settings, everything is wonderful. Those poor students will never be the same:):) XO, Pinky PS, you are adorable. 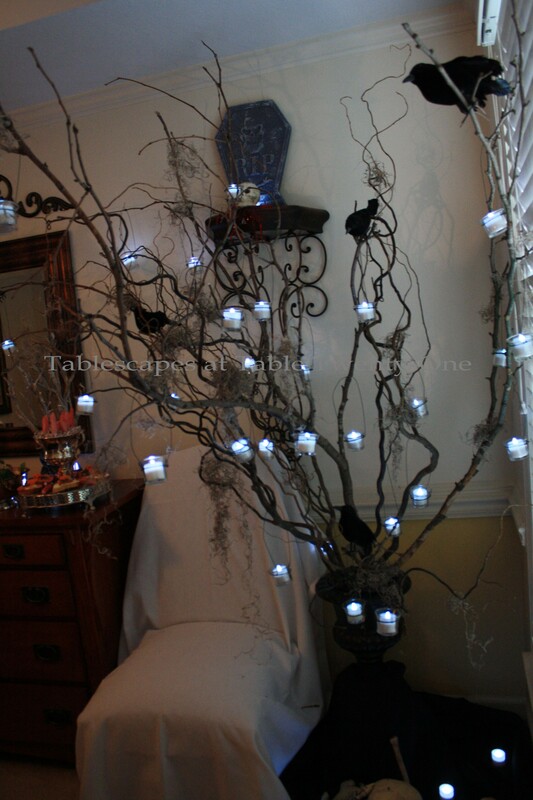 I love the branches and the tealights! Wow, the food was amazing too! Very Scary! OMGosh! How fabulous! It’s scary cool and the sound effects are really unnerving. I’ll bet everyone loved it…especially the “finger food”. Fabulous! 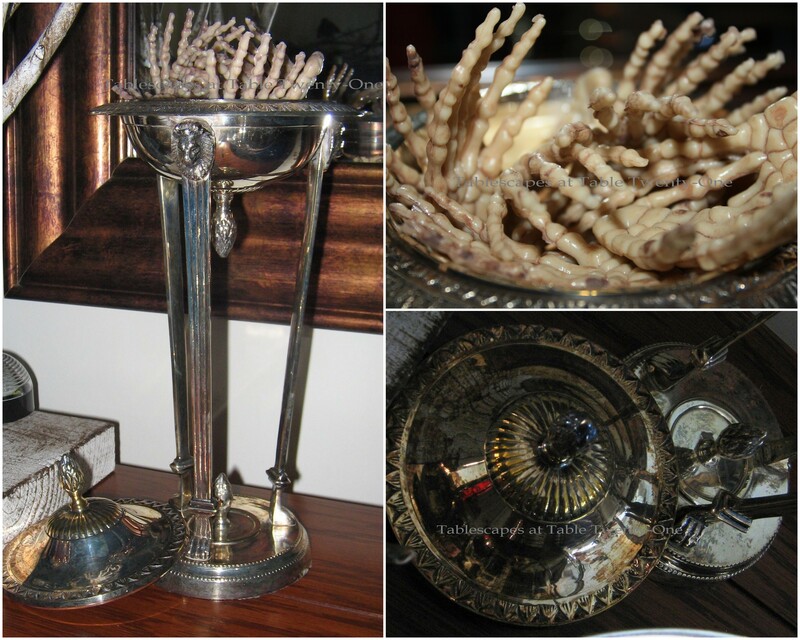 Totally creepy and spooky – maybe a little too creepy for actual dining. Alycia, I’m sure you had a lot of fun doing this scary party and I just bet your students were thrilled.This has to be a big hit with all the effects you use and those scary sounds. It’s fun to go overboard sometimes. Great job on the decorating. You have, indeed, taken this one all the way to the GRAVE girl!! This is fabulous, such thinking, and planning to pull this one off but looks like you were thrifty with your Dollar Tree items. I must get some of the crows! The plates were perfect, love the tree pattern on them. I don’t do well with snakes, so that one would have sent me running and screaming and the finger foods would be hard to swallow. So clever you are my friend! Don’t think your mind is ever at rest, such a given talent you posses. This is just too much fun, Alycia! I love it all. 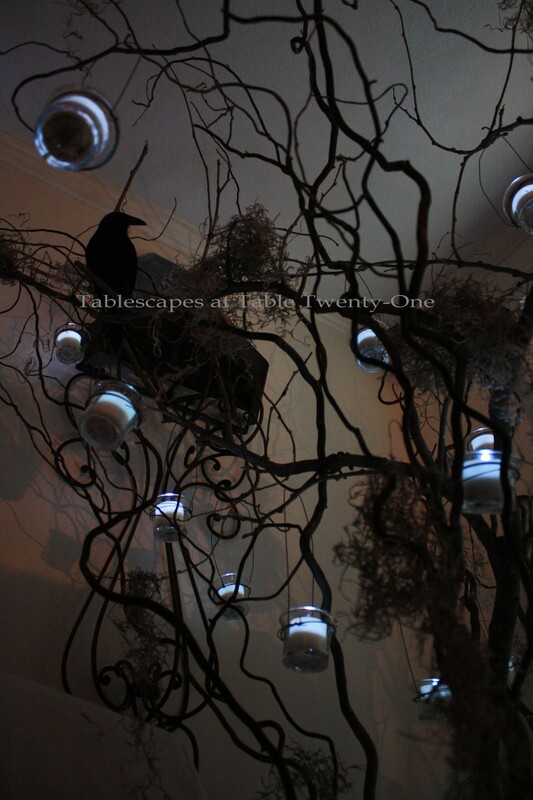 Especially the table centerpiece of the white trees with the ravens–how Edgar Allen Poe-cool is that? Way cool! Your students must have had a blast at this class. 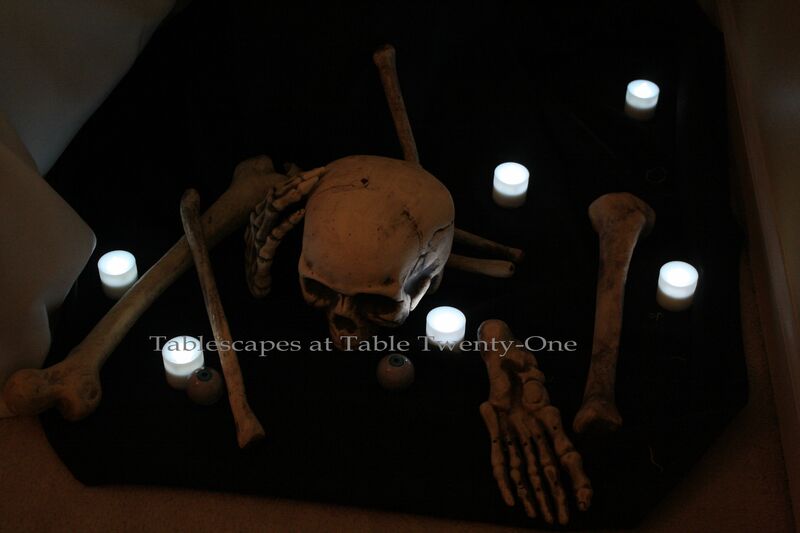 The LED lights and strobe lights were a nice touch–definitely lent to the spooky atmostphere. Brava! I don’t know how much the participants in your class are paying for your tutelage, but they are getting more than their moneys worth! Your whole setup is really ghoulish, and I can only guess at how much time and effort you put into creating it. The wine labels are great. Wouldn’t they be great for my wine bottle candelabras? I have to tell you though, I’m passing on the finger food! I haven’t even clicked the video yet, and I’m chuckling so hard at this one that my shoulders are bobbing. You totally outdid yourself!! This is all just wonderful and so creative. I giggled at the not going upstairs part and all the crazy food ideas. The table itself was chock full of “steal-ables”. I really love the branches for the centerpiece and well, just everything. 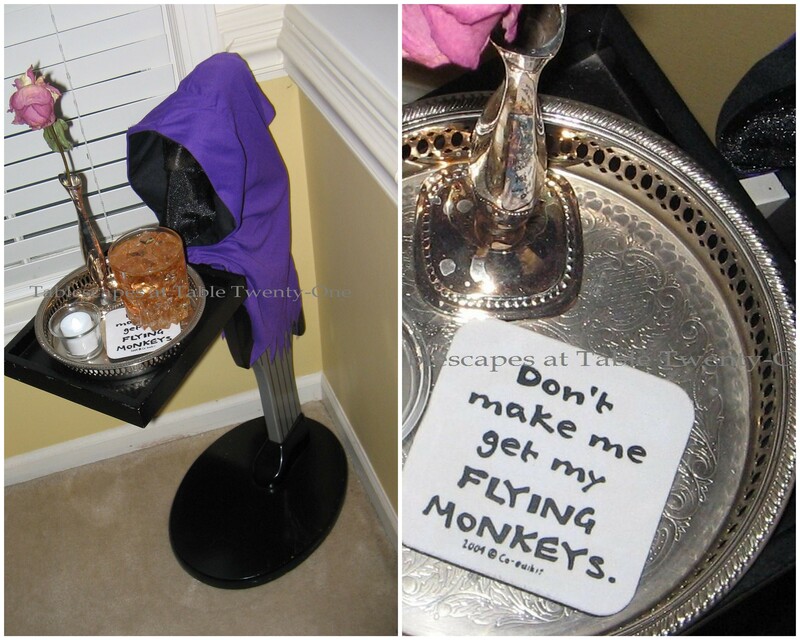 And I really want some napkins or something with the flying monkey comment. Giggling again. Not only do you have mad decorating skills, your writing is always great. This is one of my favorites from you and you make me want to get up and create something. High 5 girl!!!! Love, love, love your spiked napkin rings from a slap bracelet!! Genius!! You continue to amaze me with your creative and original ideas! You certainly mastered the art of creepy!! They are sure getting their money’s worth out of you! This is amazing! I can’t believe those great plates are from the supermarket! Is there any marking on the back? Maybe I could hunt them down! 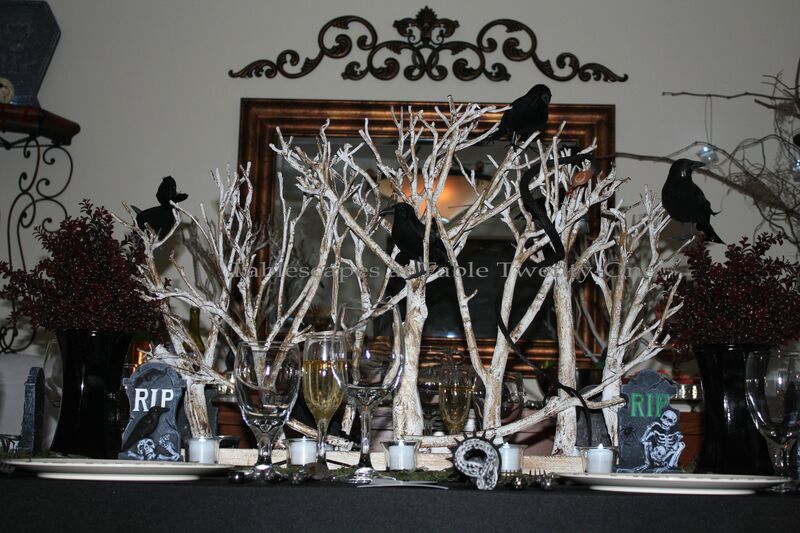 Love the centerpiece, the napkins, every spooky thing! Great job! Whew, more amazing decor from you! My favorite part was seeing your pretty face, Alycia. You know how to DO Halloween big time!!! 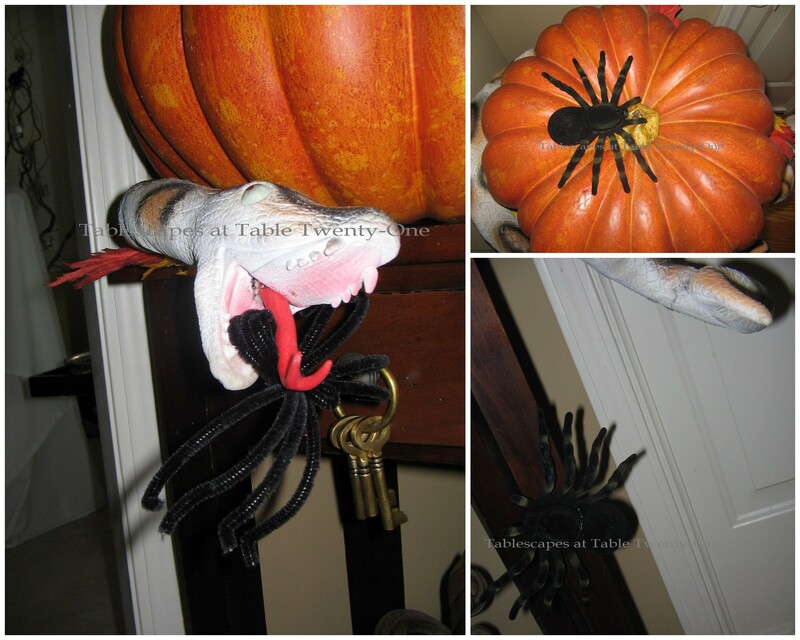 Fantastic table, Alycia, it is spooky…the snakes on the branches give me the shivers. I would rather face a rat than a snake. The centerpiece is totally awesome! Thanks for sharing your talent each week, it is such an inspiration to many of us. I love those plates! All the details – where to start? The centerpiece is amazing and the tree in the corner too! And that red boxwood! It’s all amazing! Talk about creepy…and totally amazing at the same time! Those plates are amazing and I love that black flatware. Your attention to detail never ceases to amaze me. This is totally awesome! Oh Lawd! This is quite disturbing to see and hear. LOL! No offense but I hereby dub you the Queen of Creepy! The tree branches are genius because they add such a feeling of cold empty bareness to me. The fingers on ice are a chilling sight as well. But of all your very well thought out creepy elements I have to say the snakes at the table are the best, (or worse! LOL!). That would have done me in instantly! You should open up your doors for Halloween and let your trick or treators take a stroll through the dining room if they dare. Fun stuff! Happy Halloween Queen! I just have one thing to say about this: A W E S O M E!!!!!! You are too cute behind the gauze. 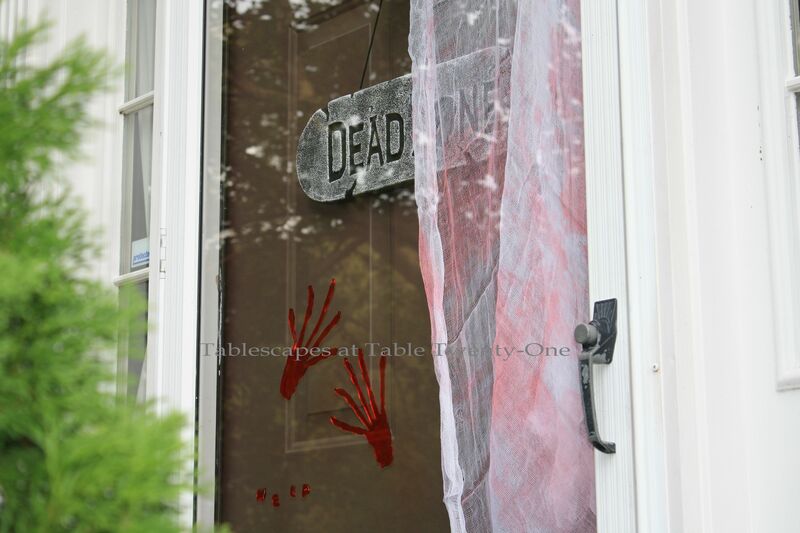 I love the table… very creepy. I don’t know how you do it but you are always inspiring. 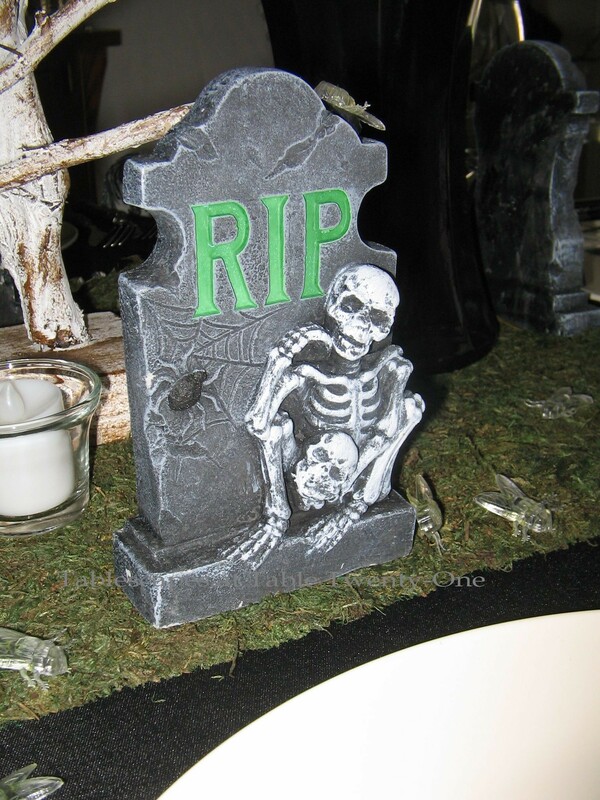 My friend, I just came back to let you know I’m at Tablescape Thursday with a Halloween tablescape…BUT, after looking at yours, it is hardly a spooky anything, lol..Your tablescape is amazing my frined, for someone who doesn’t care for it, hahahaha Did Ramon come back yet? Are you still alone sweetie? Very big hugs to you! 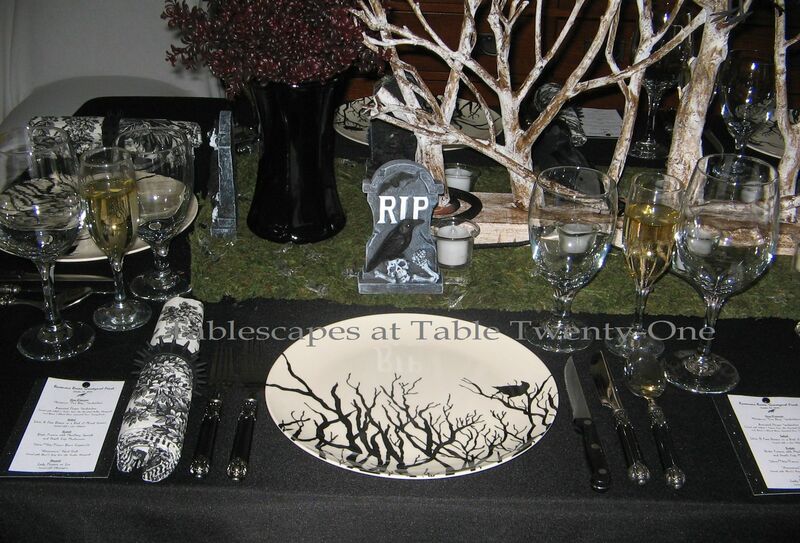 A class on Tablescaping is a brilliant idea, and what fun! This one is beautiful and very dramatic. Oh my goodness…you are one creative chick!!! 🙂 Love that goul’s grog. and your menu is awesome. Such a great scary table!! Hi my lovely friend..how you doing? 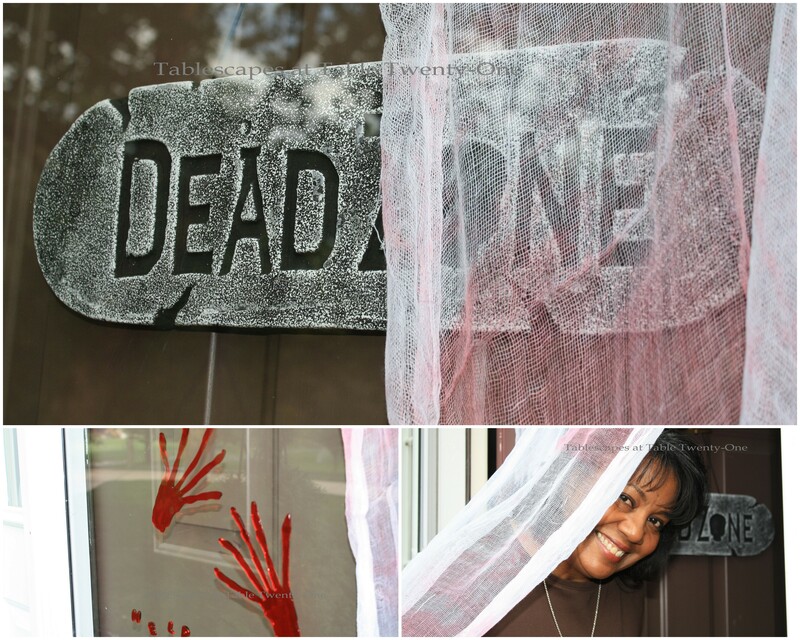 LOVE LOVE this creepy Halloween post. Bold, gorgeous and dramatic as always. Cute details here. What a talent you got! You did a fabulous job. I like all the branches and how you used all your silver pieces. It has made me rethink the table I am working on now. Hmmm.. Thanks for the ideas. Alycia…I do not think i have ever seen such an unbelievable Halloween display before…the table is so over the top creative…down to the font of the menu…and I must say the food display is pretty creepy…I mean, I am not sure if I could regain my appetite with the “fingers on ice”….you have such a fantastic imagination…those plates are perfect….Your students must have had a “night to remember”….who would of thought that creepy could be beautiful!!! 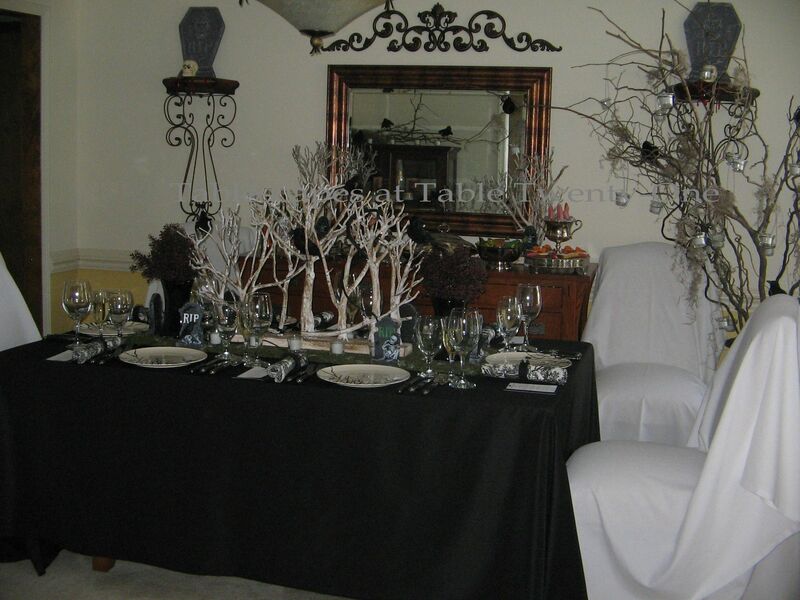 Looks like you enjoyed creating this tablescape. Do you think you could come over and create a Halloween scene for me….lol. Really great job.